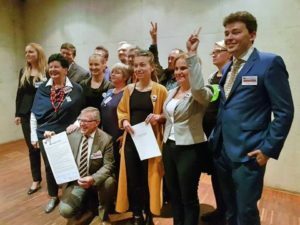 The EHF provided its support to the organisation of a Polish initiative, the Secularity Congress which was held in Warsaw on 21st and 22nd October. The congress was organized by an association composed of the representatives of numerous secularist NGOs, including Polish EHF’s humanist and rationalist members and was inspired by the so called “Women’s Congress” that have been organized for a number of years by some women’s NGOs supported by the former government of the Civic Platform. The congress was dedicated to a variety of topics related to secularity and created an opportunity for scholars, NGO representatives and politicians, as well as citizens who treasure the idea of Poland as a secular state, to come together, share ideas and declare common goals. Many of the lectures focused on legal issues, the constitution, the concordat and privileges of the Catholic Church in Poland, some focused on practical topics like the educational system or ethical queries like assisted suicide or LGBTQI rights. There was a whole panel dedicated to women’s rights as well. One of the most important voices was the one of the Polish Ombudsman, dr. Adam Bodnar, one of the very few representatives of the opposition among the authorities, who during his lecture announced he had just taken action upon the request of Polish Rationalist Association, supported by EHF, to oblige The Polish Supreme Court to take a stand in regards to the procedure requested to declare apostasy for Polish citizens who no longer want to be considered as Catholics, and the fact that currently the Catholic Church in Poland is not bound by the Personally Identifiable Information Protection Act to recognize those declarations. The congress also included an international panel with specialists from other countries presenting for the first time in Poland various models of secular state. This section was a particular contribution of the Polish Humanist Association which has for many years encouraged to adopt a more thoughtful approach to creating the Polish model of a secular state. Among the foreign speakers was Giulio Ercolessi, the President of EHF, who spoke about the historical development and the present challenges for secularity in Italy. Jacek Tabisz, President of Polish Rationalist Association, explained that a stable secularity model should not be built only in opposition to the Catholic Church (a popular idea in Poland), but it should consider the rights of atheists and other minorities, as well as the threats to human rights which might arise from all religions. Kaja Bryx, Vice-President of both EHF and the Polish Rationalist Association, presented humanist ceremonies as an example of a positive contribution of Humanists towards the secular, non-discriminating state, which could attract all sorts of people towards the idea of secularity. One of the main goals of the congress was to establish political support to the idea of secularity. The organizers prepared a Secularity Manifesto to be signed by representatives of various political parties. Not a single party represented in the Parliament accepted the invitation, nevertheless it should be considered a success that the three biggest left-wing political parties (SLD, Zieloni and Razem) have all agreed with the Manifesto and signed it. Other, smaller left-wing parties have also been invited to join. Two sitting MPs took personally part in the Congress, although not on behalf or as representatives of their Liberal party. Overall, it was a notable event and probably just the first of this kind, as most of the organizers seem to like the example of the Women’s Congress which, since 2009, has been organized every year in various parts of Poland. The organizing committee would also like to play an important political role aimed inter alia at integrating strongly divided progressive and leftist parties around the idea of secularity. The day before the Secularity Congress in Warsaw, EHF President Giulio Ercolessi also took part in the 2017 edition of the “Freedom Games” in Łódź, organized by the Polish review Liberté (one of the sponsors of the Warsaw Secularity Congress) participating in an international panel discussion on “Populism in the Age of Internet”.